iPad users, rejoice. The best Epub app for iDevices was updated yesterday with a bunch of new features. The app has new themes, a new font, and (finally) integration with Dropbox. It also unfortunately supports the new Adobe DRM, and you just know that's going to come back to haunt users. 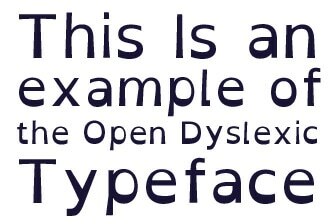 The Bluefire Reader app now supports the Open Dyslexic font. This font was created to help readers with dyslexia, and it offers subtle visual clues which help dyslexics recognize each character. You can see an example at right. The app also features updated themes, including support for a new sepia mode for PDFs. And last but not least, readers can now store their ebook libraries in Dropbox and download them directly into the Bluefire app. What's more, the Bluefire Reader app now syncs your reading location across BF apps on multiple devices. Early reports suggest that this feature is not working perfectly, but it is bound to improve. In related news, Bluefire recently revealed that they are also working on a Windows reading app. It too is based on the Bluefire platform, and it is the app I referred to last night in my rant about Windows reading apps. You can find the updated iOS app in iTunes. The Bluefire Reader app for Windows is due out some time in the next week.